Luzern was the next major station after Engelberg on our way back from Titlis. Though we had planned to return early from Titlis so that we have enough time to soak in Luzern, but Titlis was just too exciting to pull away quickly from. In the morning, we had been to the tourist center at the Luzern railway station and collected some maps and instructions on what to see from a smiling lady at the counter. But by the time we reached Luzern in the evening, it was 6:30 and we had just a hour and half till the last connecting train from Luzern to Basel. Luzern or Lucerne is the capital of the canton of Lucerne. Its in central Switzerland and is the cultural centre of the region. Lucerne developed well because of its picturesque scenery and its strategic location on the important north-south transport axis between the Swiss Plateau and the Alps. Right outside the railway station we saw the Kunst Art Museum. There was an art exhibition named ‘Vis-à-vis’ going on then. The exhibition brought together Pablo Picasso (1881-1973) and Francis Bacon (1909-1992), two heroes of 20th-century art. Picasso surprised us! It was interesting to know that Picasso and Bacon had never met in real life. Many works on display, over forty in number and produced mostly between the 1960s and the 1980s came from a European private collection who preferred not to be known by name. Must be a real art connoisseur and a multi-millionaire! Out of the museum, we walked back towards the railway station and turned left to see a spectacular octagonal tower right at the middle of a water body. The water body was the river Reuss. The octagonal tower that we saw is probably the most popular landmark and identity of Luzern known to the outside world and one of the most photographed monuments. Over 34 meters high (111.5 ft.) it was built around 1300 as part of the city wall and used as an archive, treasury, prison and torture chamber. A wooden bridge joins the tower to the banks. It is one of the oldest wooden bridges in Switzerland, constructed in first half of the 14th century as a part of the city's fortifications and named after St. Peter's Chapel, which is located nearby. The wooden bridge is lined with paintings on its ceilings that were added in the 17th century illustrate scenes of Swiss and local history, including the biographies of the city's patron saints, St. Leodegar and St. Maurice. Sadly, most of the paintings were destroyed in a fire in 1993. Nevertheless it was restored and now stands equally beautiful with flower decked and lighted barricades. From the Jesuit Church we took a left again slightly into the city, through the shops and then came out near the Water Spikes. Installed in 1859-60, it is a unique sight from the technical standpoint. It replaced the Ruess steps that channeled the water over the city mills. The so-called spikes are lowered or withdrawn by hand into the water to regulate water level. Right next to the Water Spikes was the Spreuer Bridge, also called the Mill Bridge. It was constructed in 1408 as part of city fortifications. The bridge ceiling has beautiful paintings. A painter named Kaspar Meglinger added 67 paintings that represented the “Dance of Death” between 1626 and 1635. We could see the skeletons in the 2nd picture and onwards. The Dance of Death picture signify that death is a great leveler and no one escapes death - not the fishermen, not the clergy, no one. The pictures express the feeling of people, especially at the time of epidemics. Lots more on “Dance of Death” pictures here. Spreuer Bridge was situated at the lower end of medieval Lucerne. Though medieval towns in Europe were known to be quite filthy and sophisticated Roman sewage techniques had been forgotten over the centuries, they still made some elementary provisions for cleanliness. In medieval Lucerne, people were allowed to throw Spreu (chaff) into River Reuss, but only from this lowest bridge in town. Hence the name Spreuer Bridge. Crossing to the other side of the river, we started looking for the Zeitturm (Clock Tower). It was already late and dark and we had difficulty reading the map. Thanks to a kind and enthusiastic person we met there, he showed us the way and walked all the way with us till the entrance of the clock tower premises. The Zeitturm is the oldest clock in town and it can be seen from a great distance. Out of respect, this clock is privileged to chime 1 minute before any other clock in Lucerne. We actually heard this happen when we were there at exactly 7 PM in the evening. Unfortunately the tower also closes exactly at 7PM and we could not go in. The place was so lonely and deserted and was a bit scary also. The view of the Lucerne city from the Clock Tower was spectacular. We sat there for couple of minutes (it had been a strenuous climb up till the towers) and then rushed back down. After coming back to the point where the Spreuer Bridge ended we took a left again to enter the city, looking for the beautiful ancient market places and buildings of Luzern. We stopped at the Weinmarkt (Wine Market) fountain. There was a painted house at the square - "Haus zur Sonne" with a painted facade depicting a marriage party. The painting, named "Marriage at Cannan", was painted by Eduard Renggle in 1928. In the middle ages Passion Plays were conducted here. From Weinmarkt we walked towards Hirschenplatz with lots of old houses with beautiful paintings. 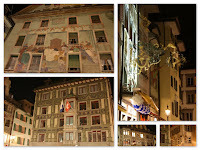 I struggled to capture some decent pictures of the wall paintings and the beautiful lamp posts without a tripod and with my shaky hands. Walking right from Hirschenplatz, we reached the Town Hall (Rathaus) and Kornmarkt (grain market). First mentioned in 1356, Kornmarkt was the grain market place of the city until the 19th century. The ground floor of the town hall served as a grain storage from 1438. From 1447 on the upper parts of the building served as town hall. Today the administration is on the other side of River Reuss, but this still gets used for official purposes like marriage ceremonies. The open arcades facing the Reuss are still used today as a weekly marketplace. Above the arcades is the Kornschütte hall, formerly a trading hall, which is now used as a concert and exhibition hall. Out of Kornmarkt we came out on to Rathausquai, the road bordering the river Reuss, walked back to the bridge near the railway station and crossed it towards the station. As we entered back to the station, I noticed a majestic arch with multiple doorways standing all alone at the middle of the square in front of the station. In the year 1971, there was a huge fire in which the entire station was destroyed except the main portal. This is what now stands as an impressive and curious arch in the middle of the square in front of the station. The entire station was rebuilt between 1984 and 1991. The all glass new station with its beautiful curved roof was designed by the Spanish architect Santiago Calatrava. We had little time left as it was already 7:40. So we rushed back, searched for our train back to Basel and breathed a sigh of relief as we sat down and the train started. Our 70 minutes in Luzern has been spent well and have been the most memorable. If I get another opportunity, I would like to come back and visit Luzern by the day, spend some more time walking across its streets which are a perfect blend of the ancient and the modern. Below is a map of the path we had taken and the places we had seen.